The humble potato: destroyer of family harmony. Roll battles are brutal and it is not just the baking, it is the eating. I've had so much buttered bread this afternoon that I don't even know if I want to so much as look at another roll this week. Worse, even after that bread binge I'm totally undecided as to who has the better potato roll. I was feeling really confident with my recipe going in and then I ate one of Mother Humble's rolls... they were unexpectedly good. Well played Mother Humble, well played. It would be easier if the rolls were not so similar. They are both moist and slightly sweet. My rolls had a lighter, open crumb and Mother Humble's rolls had a soft, fine crumb. How do you choose between that?! So I just keep sitting here, eating bread, trying to determine who the loser is and now I am getting the feeling that the only loser here is my waistline. I'll just post the recipes and the family will just have to duke this out over the next couple of days. Mix together the salt and the flour in a bowl and set aside. In a large bowl, microwave the evaporated milk until very warm, add the butter and allow it to melt. In a small bowl combine 1/4 cup of the butter/milk mixture with about 1/4 cup of cool water to bring down the temperature to about 100-110°F. Add the yeast and sugar mixing well, then allow to stand for a couple minutes. Once the milk-butter mixture has cooled enough not kill the yeast, add it and the yeast mixture to your stand mixer equipped with the paddle attachment, along with the potatoes and eggs. Mix well. Add the flour, one cup at a time, mixing on low speed. Once all the flour is incorporated, switch to a dough hook and kneed the dough for several minutes until soft and smooth, adding additional flour if dough is too sticky (up to one additional cup if needed). I should note that this dough is supposed to be fairly sticky, so only add enough flour to help the kneading process. Allow the rolls to rise for another hour and then brush with egg wash and bake at 325°F for 10-12 minutes. Cut the butter into tablespoon sized pieces and set aside. Heat the milk until warm (110-120°F ) and whisk in the eggs and sugar. Add the yeast and mix well and then allow the mixture to sit for 10 minutes until foamy. Add the flour and salt to your stand mixer equipped with the paddle attachment and beating on low speed, add the yeast mixture in a slow stream. 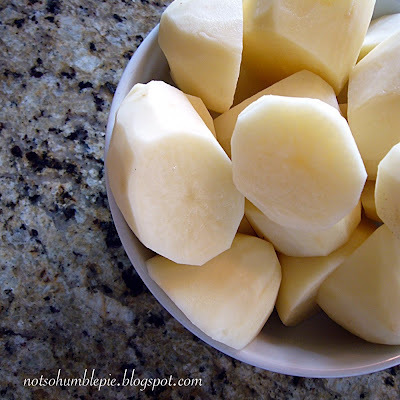 Add the potatoes and mix until incorporated. Add the butter a couple pieces at a time mixing slowly and then, working in thirds, add the shortening. Switch the paddle out for the dough hook and mix on medium low speed for 4-5 minutes until dough is soft and smooth. Place the dough into a oiled bowl and cover. Allow to rise for an hour and then punch down and shape into rolls. Allow the rolls to rise for another hour, or until doubled. Brush with egg wash and bake at 350°F for 15-20 minutes. These are both big batches of rolls, so expect about 3-4 dozen from each. These both look fantastic. 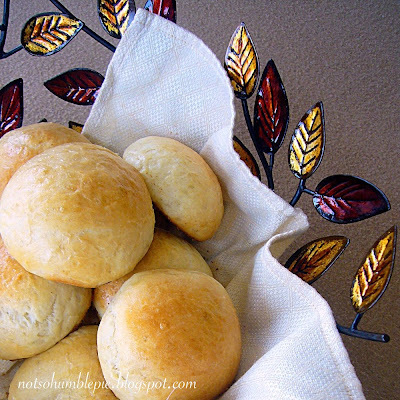 I'm going to try Mother Humble's roll with all my leftover mashed taters since I did a crackly-crusted hard roll for Thanksgiving dinner and am craving something very tender and fine now. Yum. Mother Humble's rolls were really good and I admitted defeat on Thanksgiving when my brother called the battle for her. You win some, you lose some. I am still the reigning soup champion around here, so I can live with that. 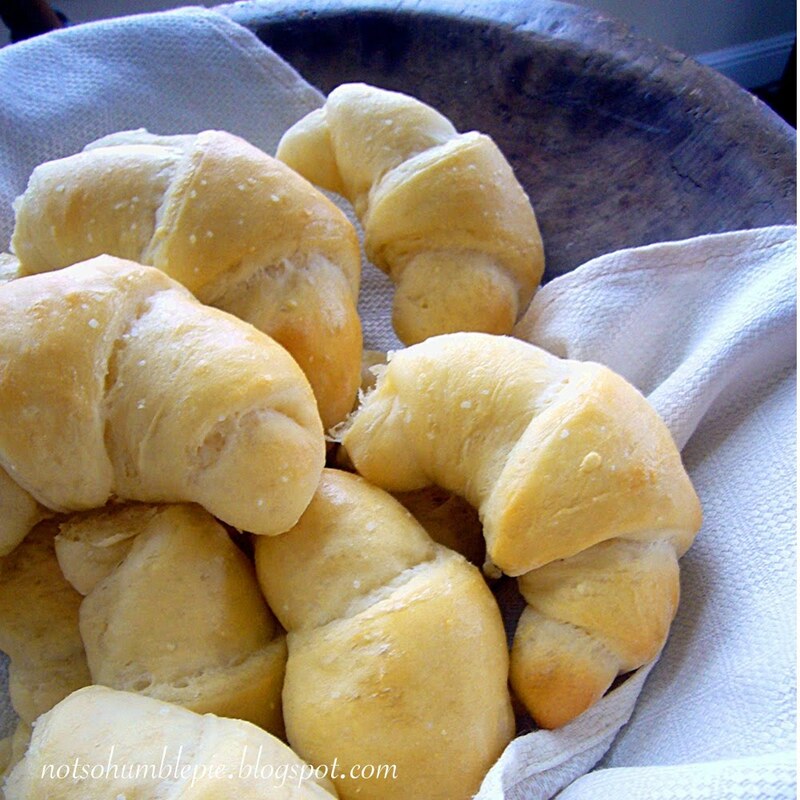 Had to let you know that I whipped up the rolls last night and blogged about them today. So. Good. Hi, I'd like to try out Mother Humble's potato rolls...but I have to ask--is the 4 1/2 tablespoons of yeast correct? That seems like an awful lot. I did a double take at the amount myself, but I've seen her dump roughly 6 1/4 oz packets of active dry yeast into the bowl so it is pretty accurate. ok - I have read through the recipe several times now - when is the sugar added?? I realized that I had missed it while mixing the flour in and just added (dumped in)the sugar as well - but I assume I should have done so earlier? Sugar should go in with the yeast, thanks for catching that. I just fixed it. I'm surprised neither Mother Humble or I noticed that yet... then again, neither of us is the best editor. Mother Humble's Potato Bread is being left alone for a few hours to rise as I type. Can't wait for it to actually be bread so I can eat it! Thanks so much! Love your blogs!